Iowa’s unemployment rate in February climbed to 4.4 percent, up from 4.3 percent in January. 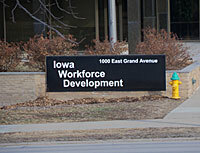 But, the latest report from the Iowa Workforce Development agency ultimately contains positive economic news. The number of unemployed Iowans rose to 74,400. The state’s unemployment rate last month is down from a year ago, when Iowa posted a 4.9 percent jobless rate. The state added 3,900 nonfarm jobs in February, up by 20,100 compared to a year ago. Those job gains were offset by losses in other areas as manufacturing shed 900 jobs in February, while the financial activities sector trimmed 300 positions.